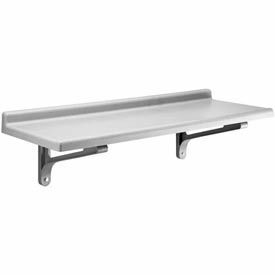 1" Heigh edge keep items from falling off of Cantilever Shelves.. Wall shelving is easily mounted from a wall with Wall Mount Kit. Wire Shelves adjust easily at 1" increments using plastic clips (included). Adjustable Shelf Supports and non-adjustable Shelf Brackets provide complete support for hanging wire shelves. Style A - Purchase wall shelving, one pair of Single Shelf Supports per shelf and a post kit. 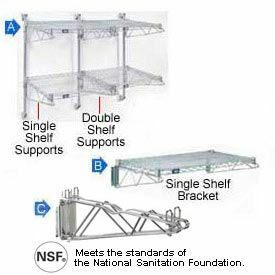 To join 2 sets of shelves end-to-end purchase 1 Double Shelf Support per joined shelves. Available in Chrome only. Style B - A pair of Single Shelf Brackets hold one wire shelf. Available in Chrome or Silver Epoxy. Style C - A Double Shelf Bracket to join 2 sets of shelves end-to-end. Available in Chrome or Silver Epoxy. Plastic Wall Shelving Is Great For Kitchens And Cleaning Areas. 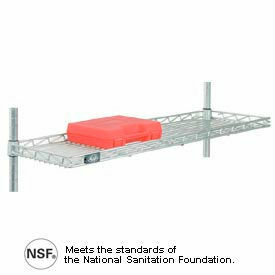 Plastic shelves utilize ion-technology that inhibits growth of mold, fungus & bacteria. Shelves are reinforced with a Camguard™ finish that won't scrape off, wash off or wear out. Made with rust free, recyclable polypropylene that is dishwasher safe. Weldless construction eliminates liquid or dirt penetration. Virtually indestructible I-beam supports have a unique snap fit rail design that ensures easy wall mounting. Shelves hold up to 150 lbs. 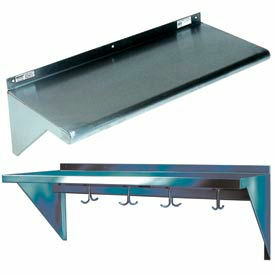 Shelves include 2" backsplash and marine front edge to control spills and cross contamination. Withstands temperatures up to 190°F. Will not corrode. 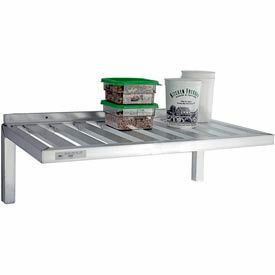 Shelves are available in Solid or Vented styles. Shelf Extenders convert empty wall space into a functional peg hook storage area. Can be used with or without Wall Shelves to provide hanging storage using peg hooks (not included). Made with high impact plastic. Extenders measure 2"D x 15-1/2"H. NSF listed. Lifetime Limited Warranty. Wall Shelves Offer Convenient Out-Of-The-Way Storage For Supplies. 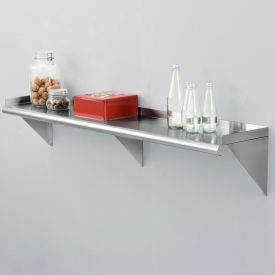 Wall shelves include stainless steel brackets for easy mounting to welded studs. 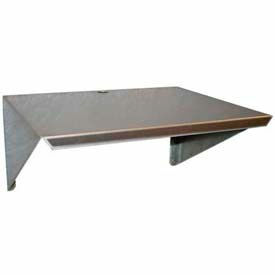 16 gauge Type 430 stainless steel shelf features a 3/4" radius front roll for strength and safety. Raised 1-1/2" retaining lips on 3 sides help retain contents on shelf. Polished to a #4 mill finish. NSF® listed. Easy assembly. 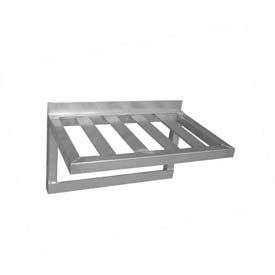 Stainless Steel Wall Mounted Shelves Offer An Easy-To-Clean, Sanitary Storage Solution For Commercial Kitchens And Other Food Industry Applications. Made using all welded, 16 gauge stainless steel that is corrosion resistant. Features a rear retaining lip. Easily mounts to wall for safe, out-of-the-way and easily accessible storage. Includes wall brackets for installation. Available with or without pot hooks for hanging storage of pots and pans. NSF® approved.